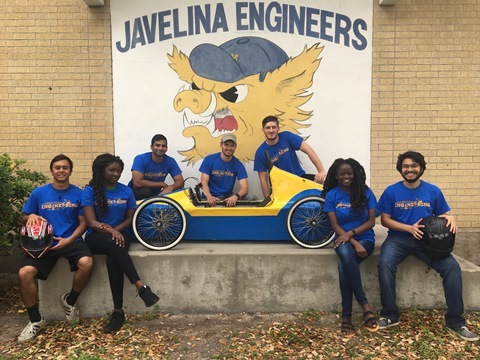 A team of students from the Frank H. Dotterweich College of Engineering at Texas A&M University-Kingsville recently competed in the South Texas USA Greenpower Electric Car Competition and placed second. This was the first time the race has been held in South Texas. In future years winners will be able to advance on to a national competition. The students were tasked with assembling a vehicle, designing an aerodynamic body and modifying the vehicle as much as possible to travel the furthest distance in 90 minutes. The Texas A&M-Kingsville team was the first to modify the roll cage. Originating in England in 1999, this was the first time the competition was held in Texas. Each car was powered only by two 12-volt batteries and one DC electric motor. Since all the teams were required to use the same motor and batteries, the design and weight of the vehicle were key factors. The Javelina car was made with fiberglass sponsored by Diamond Fiberglass in Victoria. Karan Moody, an electrical engineering graduate student from India.